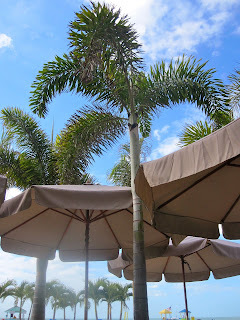 I wanted to get to the beach 1 more time before we left the Tampa area, so we headed to St. Pete Beach for a walk along the coastline and lunch at Bongo's Beach Bar & Grill. Bongo's tables are on the beach, therefore you dine under palm trees with your feet in the sand and the ocean a close distance away. With the sun beating down on us, we were in complete heaven. While I was calmly sipping on a bloody mary and enjoying my blackened haddock sandwich... I kid you not, I looked down and saw a black snake slithering past my feet. A snake. On the beach. On the tip of my flip flop! I freaked out. Jumped up. Alarmed everyone else eating on the sand. 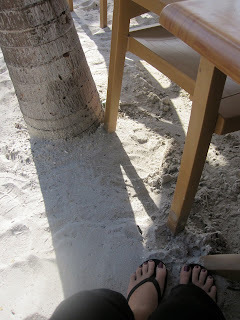 And stared at it as it slithered under our table, across the sand, under other peoples tables and into nearby bushes. Our water said that it is harmless and frequents the area about twice a week. Are you kidding me? I've never been that close to a snake and I thought my heart was going to pound out of my chest! On tap next? We're off to my favorite city in the country! Oh my word. Slithering snakes, no matter whether they are harmless or not, still make my heart stop! Gorgeous scenery - I am jealous of your travels to sunny places! Can't wait to see what adventures you and B have in store for you next. OMG I just got chills all over me when I read the word snake. I wouldnt have been able to jump cause this girl would have fainted in the sand. I love reading all about your travels I have never been able to travel much but I feel like I have traveled alot here lately just by reading your blog:) Thanks for being so kind and letting me enjoy your life travels. well aren't you two just presh?! This little snake story reminds me of the time me and mom stopped at a gas station and there was a big fat rat running around outside near the door. My mom told the attendant about the little fella and he was just like "oh yeah he's out there a lot." Uh what? AHHHH, I hate snakes. I would totally do a flip-out if that would have happened! I absolutely love that pictures at the end! OMG I would have totally made a scene about the snake and maybe peed my pants a lil too. my dad got bitten once. that was an ordeal. you should have seen the way my mom and i handled it. lets just say not our finest hour. Been to St. Pete's beach once though; for a wedding. It was just gorgeous. Have a wonderful Sunday! We love it there, isn't it the best :) Oh gosh I would have FREAKED out if I saw a snake that close to my foot too! Ahhh!